Belo Horizonte (Portuguese for "beautiful horizon") is the capital of the state of Minas Gerais, located in the southeastern region of Brazil. Tancredo Neves International Airport, popularly known as Confins International Airport, is located 38 km from downtown Belo Horizonte. It was here that Loyal Reader #4 attempted to board an international flight with two tins of sardines taped to her torso. Or maybe they were in her carry on, I'm not sure. Anyways, she was only in Brazil for 72 hours and knew there was the possibility that the tins wouldn't make it past Airport Security. 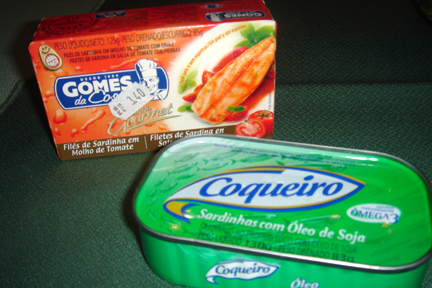 She procured said tins and they were removed from her by Brazilians with automatic weapons. She was allowed to leave the country. I was so bummed, I mean, you can take SNACKS ON THE PLANE!!! The Society thanks her for her valiant attempt, and would like to award her this Sardine Tin Pendant. But they're a Buck Ten plus shipping and that just ain't gonna happen. When will The Man stop oppressing us?